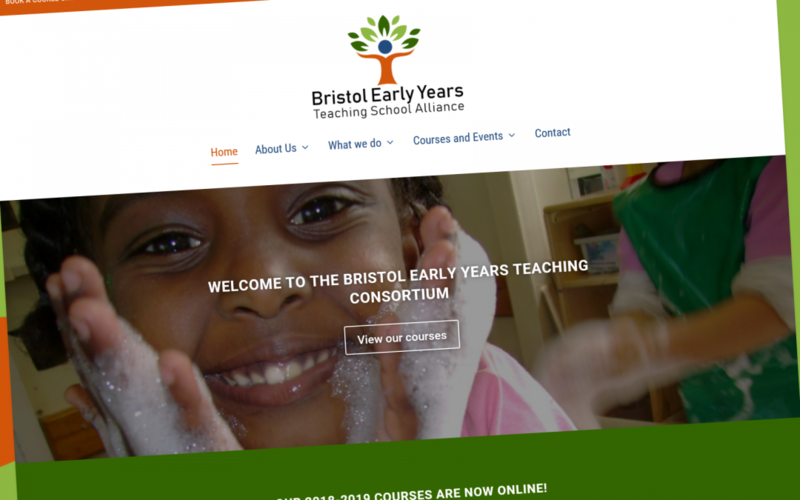 In August 2018, Chaos Created worked on the relaunch of the Bristol Early Years Teaching School Alliance which had been previously known as the Bristol Early Years Teaching Consortium. As part of this work, Chaos Created developed a new logo and branding for the Bristol-based teaching school, a Continued Professional Development Booklet, and a redesigned website. The previous logo, which had been in place since before we began working with BEYTSA, featured three trees, representing the three schools that made up the consortium. The new alliance is led by St. Paul’s Nursery School and Children’s Centre, with Redcliffe and St. Werburgh’s hosting some of the courses. So we set about developing a brand that promoted growth, and learning, keeping the existing colours for consistency. We brought a lot more colour to the website too, keeping a professional feel to the site without having the site look as corporate as its previous incarnation. The booking system we developed for the previous incarnation of the site has been improved too, and we’ve made all the courses available to view online, with detailed information. You can visit the BEYTSA website at http://beytc.co.uk and read more about the project here.